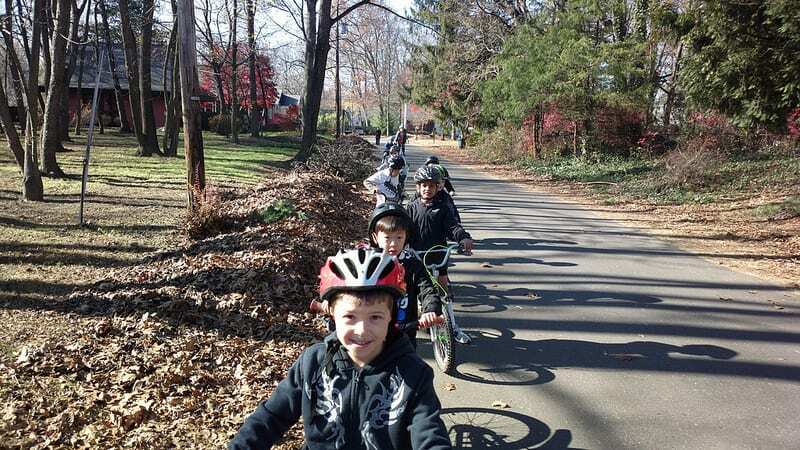 Nine eager young bicyclists and their bikes, mostly second-grade scouts from Pack 66, joined the WWBPA for a lesson on bicycle safety on a beautiful Saturday in November. 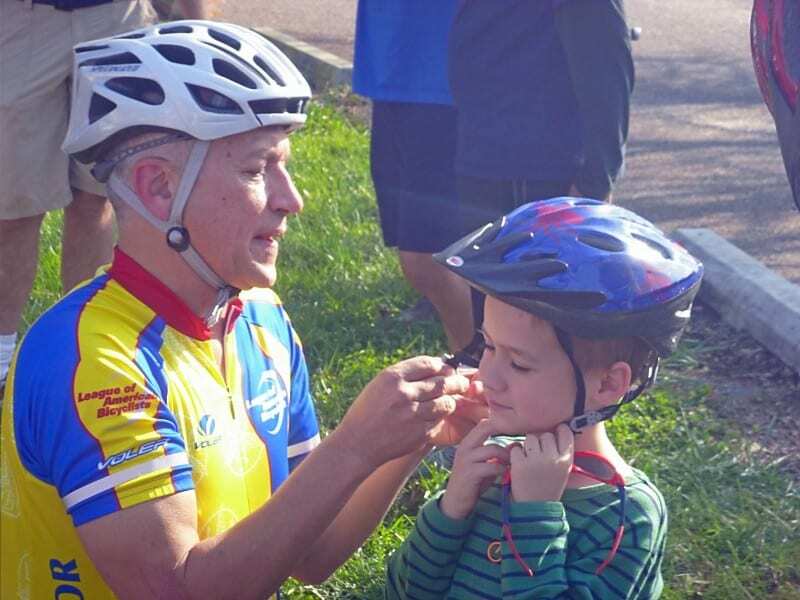 We shared lots of valuable lessons, from pre-ride checks, known as the ABC Quick Check, and proper fits for helmets (flat on the head, and snug) to being courteous and watching for others, whether riding on the sidewalk or in the street. We hope they always signal! But these kids really just wanted to ride, so we headed out to test their skills. The branches left over from Sandy that were scattered on the sidewalks behind Maurice Hawk Elementary School became our obstacle course, and the group also got a taste of riding in the street. All did great, and we hope to see them on a bike ride next summer! 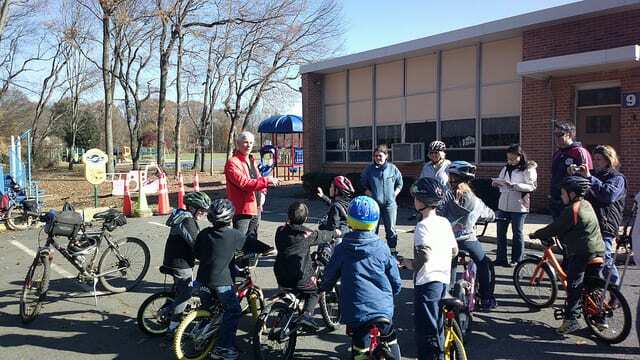 This was our second session for scouts in which we talked about bicycling basics. If your group would like something similar, email us at wwbikeped@gmail.com. Two dens of 8 and 9-year-old scouts from Pack 66 got a 90-minute lesson in bike safety led by Les Leatham, a West Windsor resident who is a bicycling instructor certified by the League of American Bicyclists, and some volunteers from the West Windsor Bicycle and Pedestrian Alliance. The group went through helmet fitting, the ABC Quick Check (Air, Brakes, Cranks, Chain and Cassette, Quick Release and a final check) that should be performed before heading out on a ride, talked about what they already knew about bike riding and some things they didn’t, including that bikes on the road must follow the same rules of the road as cars. Then the group took a ride through Mercer County Park, and finished with a different sort of race: how slow can you go, without stopping, turning around or putting your feet on the ground. This tests their balance skills and ability to handle their bike in a fun way. The last one to reach the finish line was the winner. The Penn-Lyle Road improvement project near High School South is complete, and its neighbors love it. No longer do school buses block one lane of traffic every afternoon as they line up waiting for students to transport home. 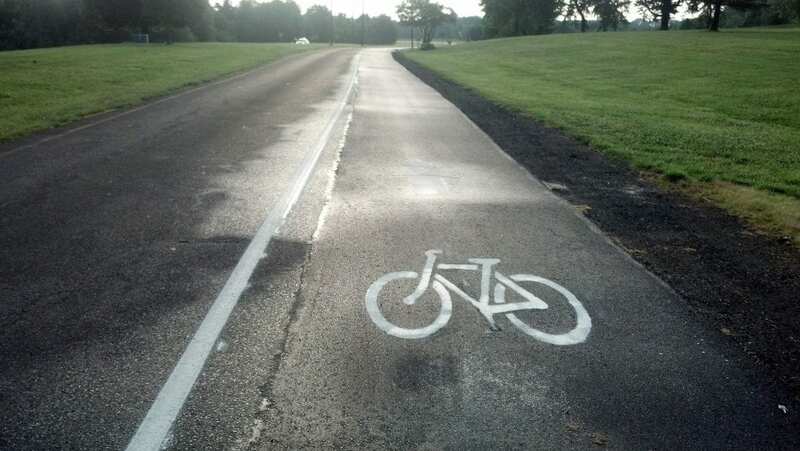 At every other time of day, clearly marked bicycle lanes are a pleasure for bicyclists. After the improvements made last year to another stretch of this heavily traveled road, we now have bike lanes down the entire length, improving the bikeability of our community. In addition, the reconfigured right turn lane, suggested by the Delaware Valley Regional Planning Commission (which also has suggested dedicated left-turn lanes in all directions at Clarksville and North Post Roads) improves visibility of approaching traffic from Clarksville Road for cars wanting to turn onto Clarksville Road from Penn Lyle Road, which traffic engineers are sure will cut down on accidents there. This project, supported by the WWBPA, is another example of Complete Streets that take all users into account, and the traffic improvements have really made a difference. Thanks, West Windsor Township. More than 2 1/2 years ago, Edward Boye was killed by a motorist while riding his bicycle on Dutch Neck Road in East Windsor, not far from the border with West Windsor. This month, the driver, Margaret Corrigan, was sentenced to three years in jail (and more here). Mr. Boye was disabled and used a special tricycle to get around. Ms. Corrigan was under the influence of medication when she struck Mr. Boye. She pleaded guilty to third-degree assault with an automobile and driving under the influence of narcotics in May after initially being charged with vehicular homicide. Motorists, please share the road with cyclists, give them plenty of room while overtaking and refrain from passing on a curve when you can’t see oncoming traffic. Cyclists, follow the rules of the road, including riding the same direction as traffic, and be predictable and visible. With daylight hours shrinking, make sure your lights work, and consider adding a reflective vest to your safety gear. We sell them for just $10 at the farmers’ market. As a frequent bicycle commuter through Mercer County Park, I was recently surprised to find significant road construction taking place on the main park road. The appearance of road construction crews was an indicator of some great news for users of the park. 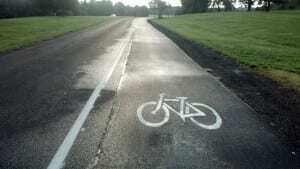 The once-gravel shoulder of the main park road is now paved and lined as a bicycle lane. Previously, bicyclists using the main park road had to contend with a very narrow lane for traffic and bicycles. In addition, the transition between paved road and gravel posed a potential safety hazard. The problem no longer exists. Kevin Bannon, Mercer County Park Commission’s executive director, is obviously thrilled with the completion of the project, too. He pointed out that the road situation was one of the more common complaints heard from park users. He requested the funding for the project in 2010 and received approval from the Freeholder Board and County Execute Brian Hughes (who, I’m told, is also a huge fan of the project). The cost of the project is $601,614, which includes all logos, striping, signs, crosswalks and turnarounds. Thank you, Mercer County! We know the park is already popular with bicyclists, and this will make it safer and even more appealing for a wider range of cyclists. 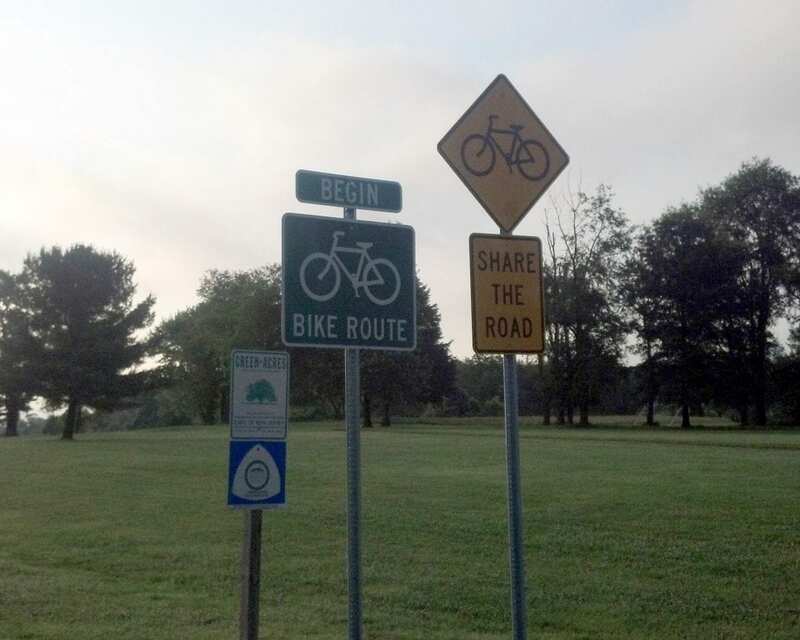 The WWBPA hopes we can one day see a bike route or multi-use trail through the park to Mercer County Community College. The WWBPA had something for everyone in May. Where did you see us? On May 7, we led our second annual walk to mark the start of the farmers’ market season. 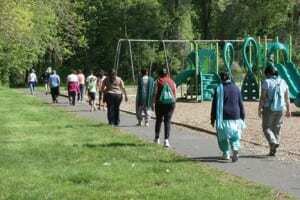 About 20 people, from grandparents to grandchildren, joined for a walk from Maurice Hawk School to the Farmers’ Market at the Vaughn Drive Parking Lot. The first stop was at the Arts Center on Alexander Road where Greening of West Windsor (GroWW) was holding an Herb Sale to benefit the plantings at the Arts Center. We observed the new sidewalk along Alexander Road from Scott Avenue to Wallace Road under construction, and noted that on next year’s walk we would use it. Crossing Wallace at Alexander instead of at Scott is much safer because cars have a much greater sight line to the pedestrians. We proceeded to the station, under the tracks, and along the pathway to the Farmers’ Market, where the WWBPA handed out maps and held a drawing for a T-shirt, a reflective vest, a set of lights, a set of ankle bands and a couple of Share the Road decals. As part of National Bike to Work Week, we joined Greater Mercer Transportation Management Association for a chilly “bikers breakfast” at the station on May 17, offering food, drink and encouragement to cyclists and others. 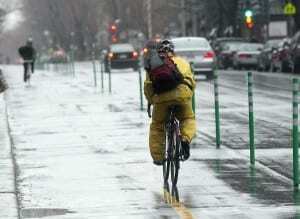 We hope some are ready to get back on a bike, even if not to get to work. 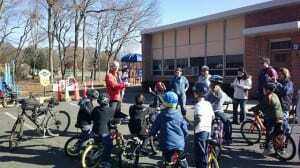 On May 21, we were back at the farmers’ market, teaching about 50 kids to ride bikes without training wheels, using a “balance first” method taught to us by Bike New York. 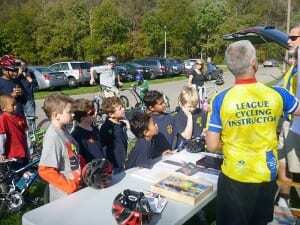 On May 28, we were at BikeFest, talking to participants about what we do and offering ideas on where to ride. Our “Ride of Silence,” to honor cyclists killed or injured on the roads, was delayed by rain until June 1. We rode through West Windsor, led by a police car and funeral hearse. If you missed us, check out the photos. What happens when a motorist hits cyclists? This video looks back at the impressive media and public response to a road incident in the Netherlands between a reckless driver and the three cyclists he struck while they were stopped waiting for a traffic light. The motorist was arrested and temporarily lost his driving license. He would have lost it permanently had he not passed an expensive exam to retain it. It was in the news for months. Even though no one died. It’s certainly not the sort of public (or media) response we see here. This camp focuses on some of the fundamental skills required in cross country mountain bike racing as well as the mechanics and general maintenance of bicycles. 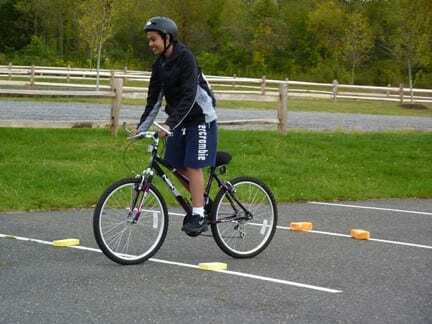 Campers will learn skills associated with mountain bike racing such as proper body position for maximum balance and control while navigating through narrow trails and terrain. 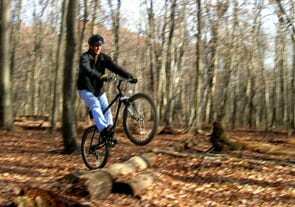 How to properly go over obstacles such as small log climbs. Along with these skills campers will also learn proper racing etiquette as well as how to take care of their bike with some basic maintenance. For more information, go to Mercer County Community College Youth Summer Sports Camps or call 609-570-3779. July 29, 8:30 a.m. – 4 p.m.
For more information and registration, go to Camp College or call 609-570-3311. West Windsor-Plainsboro Community Education presents a Roadside Bicycle Maintenance class this spring. This 90-minute class will give you the confidence to take that longer bicycle ride. You will be introduced to basic tools and equipment and how to use them: how to repair a flat tire, how to re-install a chain, how to overcome a bent wheel on a ride (to get you home), plus have your questions answered. More information at WW-P Community Education. A recent study of Montreal cycle tracks showed they attract 2.5 times more bicyclists and have a 28% lower risk of injury, compared to similar roadways with no bicycle facilities. 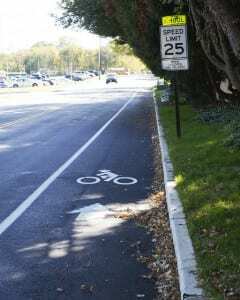 Cycle tracks, also known as buffered bike lanes, are placed between the curb and on-street parked cars, sometimes with a physical barrier and other times with a painted buffer area. These lanes are a key feature of the Princeton Junction Redevelopment Area plan, but were removed from the Transit Village area in favor of the shared space concept. The Montreal study, published in Injury Prevention Journal, is consistent with a recent New York City study, which showed 21% fewer injuries, a near tripling of bicyclists, and a reduction of bicyclists using the sidewalk from 46% to 4%. Click to read more coverage of the New York City study. We have to confess to wishing these studies were available at the time Township Council was deciding to accept the proposed lawsuit settlement with Intercap against the township. Is it too late for West Windsor’s transit village? Click here for the Montreal Gazette’s coverage of the Montreal study. What Could Make a Good WWBPA Event? More frequent walk to school events to turn it into a habit, rather than a special event, perhaps working with PTAs (Bike Walk Montclair).